Social Media and Influencer Marketing High Five! 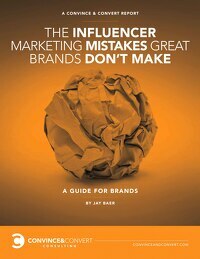 While working with the world’s greatest brands on influencer and social media marketing, we’ve identified seven key mistakes great brands just don’t make. I hope you find this playbook massively useful. Let me know what you think of it directly. Let’s work together to create an influencer strategy that builds trust and sales. Take a look at how we help some of the largest companies in the world with their social and influencer marketing. If you think it makes sense to chat, please let us know. We can’t wait to get to know you!